From the Hancock County Courthouse, take Hwy 22 southwest for 7.2 miles to Devereux. Turn right (at backwards fork) onto Main Street. Go 0.2 mile to the dead end and turn left on Jones Chapel / Devereux Rd. Go about 4 miles. Just prior to reaching the old abandoned store on the left is a driveway. Turn left and follow the driveway for about 1/4 mile until it dead ends. Walk 100 yards past the old home place to the approximate location of the cemetery. Cemetery has been destroyed. All information is from family records submitted from Beth Thurmond of Clarke County, Ga. 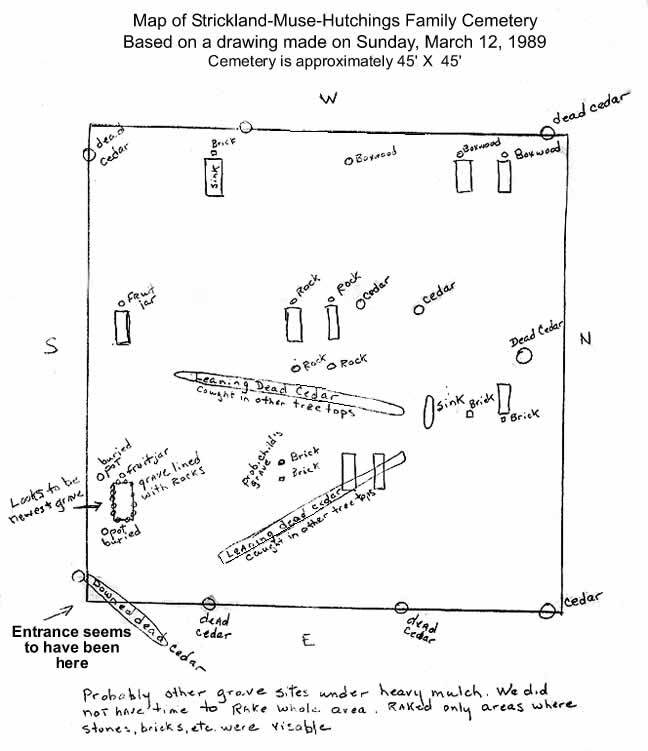 The location is based on the recollection of Beth Thurmond, and the diagram was done by her on Mar. 12, 1989. A title search done on the cemetery location showed that the property had been owned by the family since David Strickland purchased 287-1/2 acres (originally granted to Robert Smart on Oct 13, 1785) from Reuben Jones of Greene County on Dec. 24, 1792. The last portion of the 287-1/2 acres went out of the family in the 1940's. Graves 1 through 7 are known to be buried here. Graves 8 through 17 are possibly buried here. child of James Robert and James Anna Hutchings Atchison. All info per family members. child of James Seaborn and Lila Thompson Atchison. All info per family members. First h/o Evie Mae Atchison Downs Segrest. Killed in lumber truck accident. All info per family members. b. Warren County, Ga. h/o James Anna Hutchings Atchison. s/o James Seaborn and Martha A. E. Reynolds Atchison. All info per family members, family Bible, and obituary. b. N.C. Died aged 69. Possibly buried here. All info per family members, family Bible and Hancock County will. d. in 81st year of her age, per family Bible Possibly buried here. All info per family members. d. in the 76th year of his age, per family Bible and Hancock Co. will. Possibly buried here, per family members. d. in the 65th year of her age, per family Bible. Possibly buried here. "Just 74 years old" per family Bible and Hancock Co. will. Possibly buried here. d/o David and Elizabeth Strickland, and m/o Daniel Muse. Possibly buried here. All info per family members, family Bible, and 1850 Census. d/o Daniel and Elizabeth Waller Muse, and twin sister of Gillian C. Muse. Possibly buried here. All info per family members, family Bible and Hancock Co. will. s/o Mourning Strickland Muse and h/o Elizabeth Waller Muse. Possibly buried here. All info per family records. h/o Gillian C. Muse Hutchings. s/o Edward and Sallie Logue Hutchings. Possibly buried here. All info per family records. w/o Daniel Muse. Possibly buried here. All info per family records and family Bible.